In the 1980’s, America’s toy companies realized that syndicated cartoons where perhaps the most effective vehicle for marketing their wears to kids. Mattel opened to the floodgates with a Filmation produced series based on its Masters of the Universe toy line. The joint venture was a resounding success, helping to move Masters of the Universe merchandise out of toy stores by the truck load. Not to be outdone, Hasbro had similar plans for a new product that was actually a hybrid of the Microman and Diaclone toy lines from Japan. It featured robots that transformed into a variety of vehicles, weapons, and even animals. There would even be an accompanying Marvel comic in the vein of Hasbro’s successful G.I. Joe: A Real American Hero line. The formula worked yet again, as Marvel/Sunbow’s syndicated Transformers cartoon proved wildly popular. A feature length animated film was released on August 8th of 1986. It was meant to serve as a bridge between the shows second and third seasons. The film unintentionally became a rite of passage for fans, exposing them to the harsh realities of death and loss. The Transformers The Movie takes place in the year 2005. The Decepticons have gained control of Cybertron, while the Autobots have set up operations on both of its moons. Megatron (Frank Welker) and his minions plan to infiltrate on Autobot City on earth via a Trojan horse strategy. The Battle results in both sides taking heavy casualties and being forced to retreat. Meanwhile, a giant mechanical planet named Unicron (Orson Welles) floats through space, devouring any planet that crosses its path. It plots a course for Cybertron as it plans to feast heartily on the Transformers home world. Autobots, Decepticons, and humankind alike find themselves embroiled in a battle of unimaginable scale. 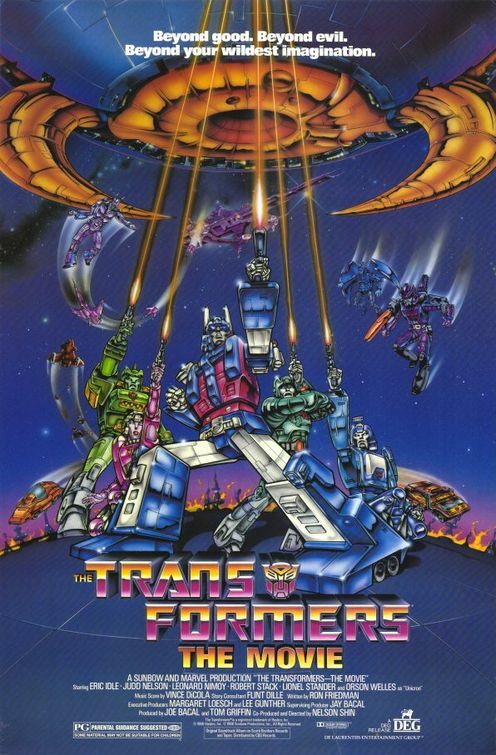 The Transformers: The Movie boasted a budget and production values that were exponentially better than any single episode of show. That’s still not necessarily saying a whole lot, since the Marvel/Sunbow series suffered from limited animation and inane plots. The movie had to offer kids something they couldn’t see on a 22 minute episode. Even the list of voice actors characterized the film as something much more extravagant than what fans were used to. It included Eric Idle, Judd Nelson, Robert Stack, and Leonard Nimoy. Then there was the Heavy Metal soundtrack that added a bit of gloss to the pseudo-seriousness of the proceedings. Despite all of those elements, The Transformers: The Movie is a rather insular and xenophobic affair, offering nothing of substance for the uninitiated. Perhaps the most insurmountable hurdle that director Nelson Shin and his associates placed in their own path was the films callous disregard for its target audience’s attachment to the main characters. Iron Hide takes a fusion cannon blast to the face. Optimus Prime (Peter Cullen) is famously killed during the siege on Autobot city, which takes place well before the halfway point in the film. Primes death was even hinted at in the films trailers, telegraphing its nihilistic bend. Then the film committed the ultimate sin of replacing old characters with new ones that were hardly as engaging or as visually satisfying. This was done to usher in a new line of toys, as Hasbro was discontinuing the generation one lineup. Despite it’s many flaws, the film does have some engaging action sequences. As traumatic as Primes death was, it did pack an emotional wallop that was nonexistent in other cartoons of the time. Stan Bush’s “The Touch,” as corny as it is, fits the milieu perfectly, as was Vince Dicola’s electronic musical score. The film failed to recoup its budget at the box office. However, it found new life on home video among kids who he had been prepared for its violent edge via slightly more “adult” fare like Robotech and Starblazers. The film itself stands as an interesting time capsule piece. Who would’ve thought that The Transformers would fair exponentially better as a live action film made many years after the toys peaked in popularity? Alas, there are often many bumps in the road to finding the medium that best suits you. Happy Birthday, Unicron.